I finally got around to decorating the interior of the truck. I had a few things up, but got the rest this weekend. If you enlarge the photos, you'll be able to see the details a little better. Don't you just love my Santa towels? 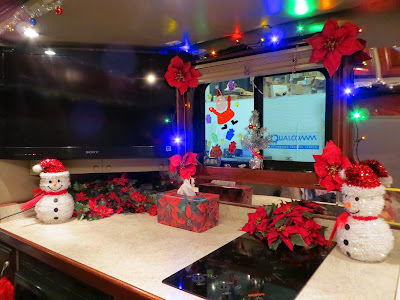 You can see my Santa window clings, the tissue box I covered with the poinsettia wrapping paper, my little poinsettia flowers on the edges of the window, and my sparkly santas. This is the area where you go from the sleeper into the cab. 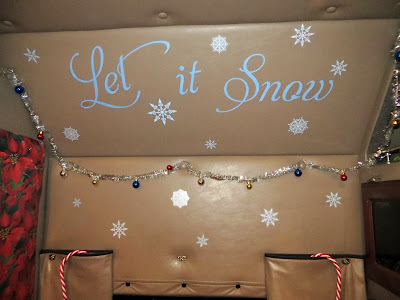 The curtains are folded back with candy canes hanging over them, I wrapped the bathroom door in the poinsettia wrapping paper, and put up the Let It Snow wall decoration. Here's a closer look at the wall decoration....I love the snowflakes. And this is the little shelving nook next to the bed. As you can see, the poinsettia theme continues here. 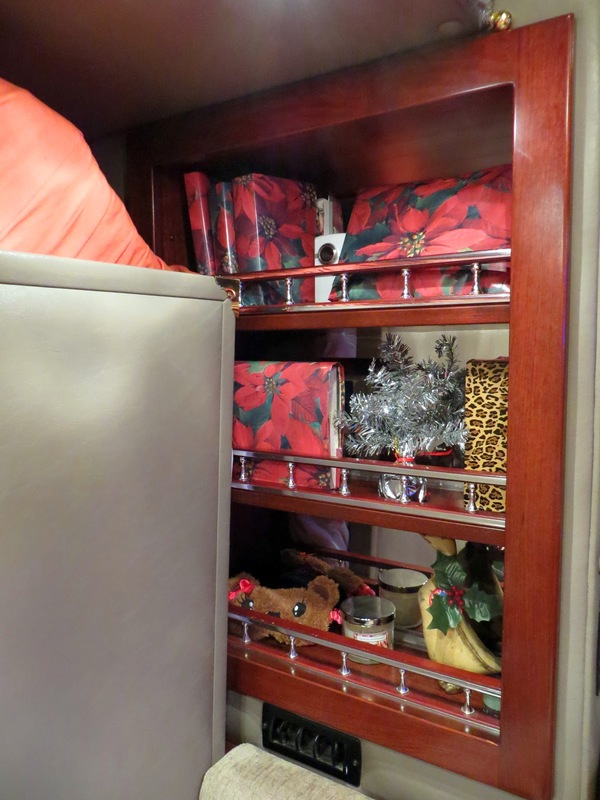 I covered my books with the wrapping paper, added a sparkly little silver Christmas tree, put my Twisted Peppermint candle on the bottom shelf, and gave the duck a holly necklace. I have a Christmas rug, and I'll also be covering the back door with wrapping paper. 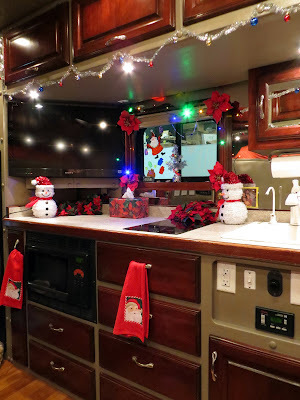 I have to finish the cab, with more lights and poinsettia garland, and Ed still has to finish the outside of the truck, adding our decorations to the grill. I'll come back and post those photos when we're done. I'm back! These next two photos are from my phone, so not as good as the others. If I take more pictures, I'll replace these with better ones. Here is Ed in the cab of the truck. 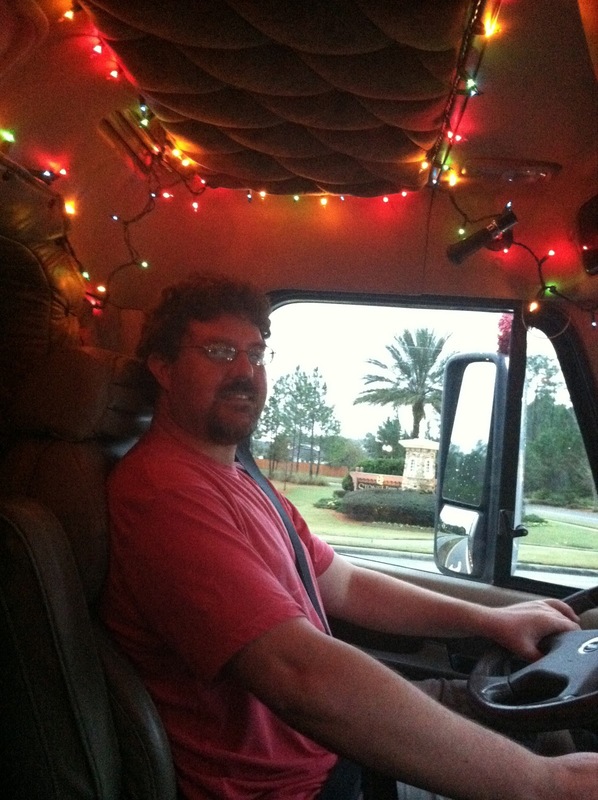 I have lights all around and a string of poinsettia holly on the dashboard. It looks VERY pretty at night. 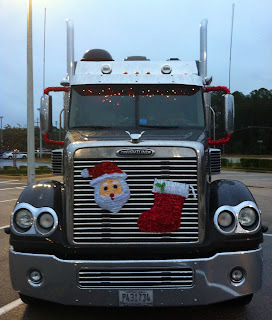 And then this is the exterior of the truck, with the red garland on each of the side mirrors, and this year, Santa and a stocking on the front. The red in the stocking and the Santa hat is sparkly like the garland. You can also see the lights in the cab a little bit. 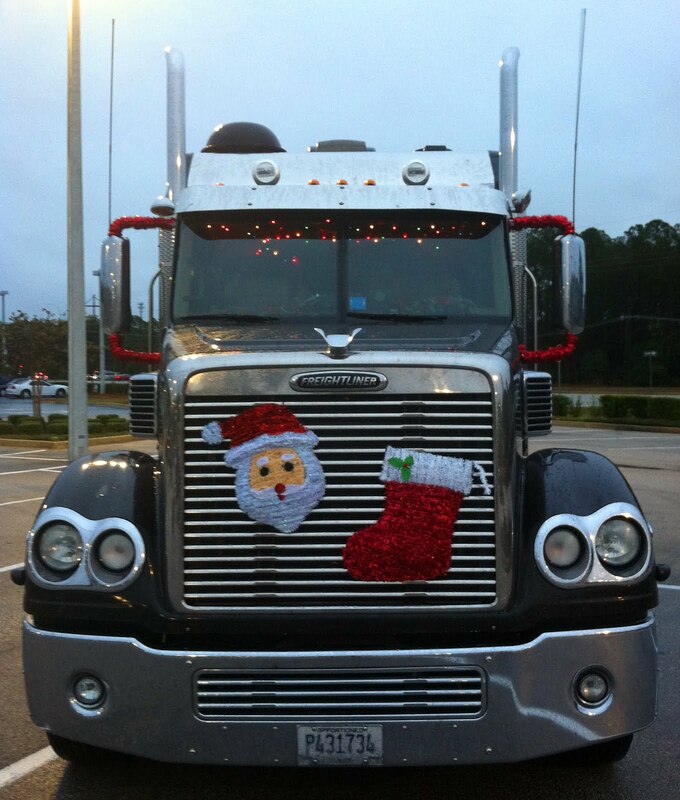 I'd say this rig is ready for Christmas!! Really looks great! It seems that you do a better job every year. Love how your 'home' looks ready for Christmas. Santa will certainly visit you two. great job. 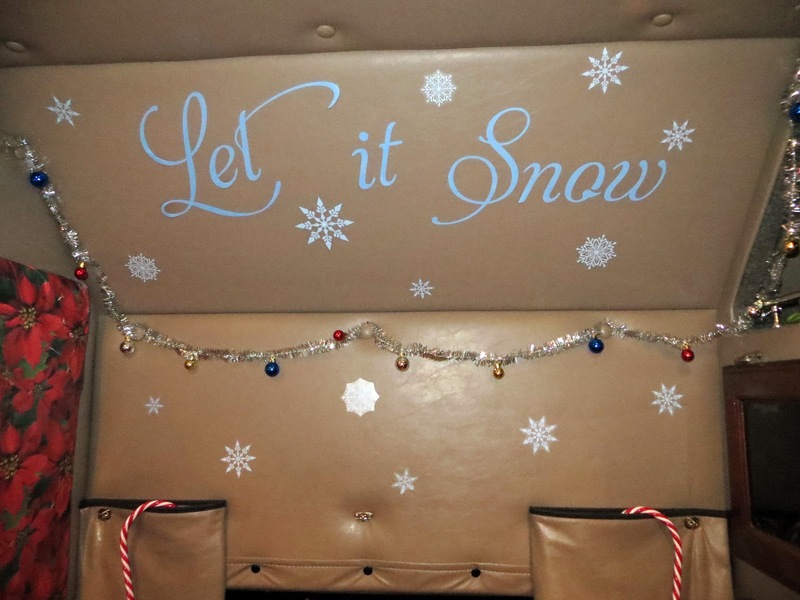 Although you guys might be the only truckers with "Let It Snow" on your truck. GIL: Thanks! I keep trying to see where I can inject a litle Christmas color and decor. Covering the doors with wrapping paper was a new thing this year. I like it! ANON: Thanks so much! I AM the Queen of this rig, you know! MAE: I'm looking forward to Santa's visit! 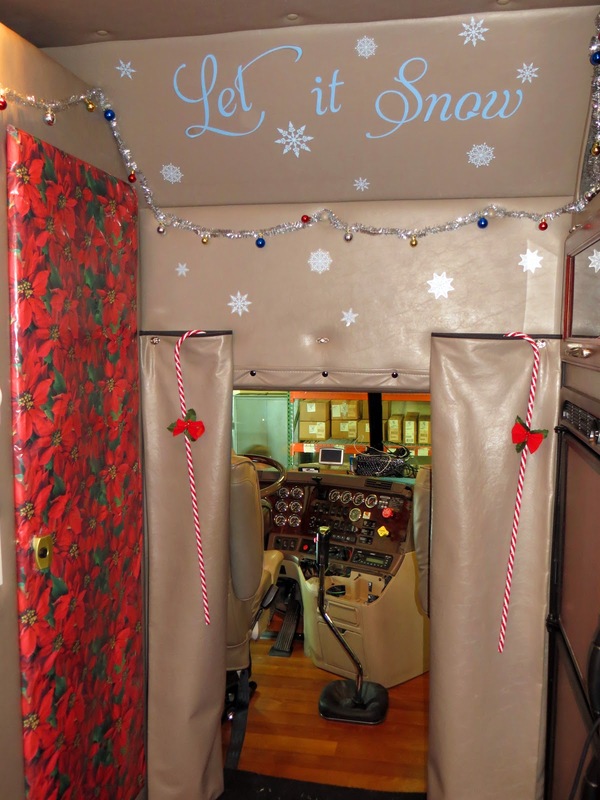 An elf with a CDL! Salena, it's so cozy and wonderful. Way creative to have covered the books on the shelf. So glad you and Eddie are in the spirit. We are only 2 weeks out from Christmas Day. Does that seem possible? I do have pointy ears and shoes with bells on them.